ALSPEC AluSpace has entered into a strategic partnership with Dulux Powder Coatings, bringing together the depth of experience and expertise of the two highly regarded firms for the benefit of their customers. 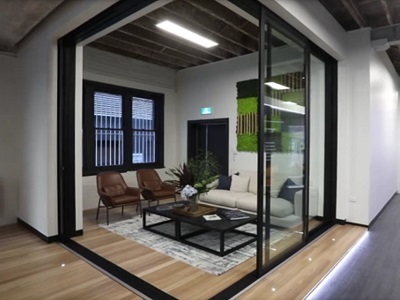 As Australia’s leading designer of innovative aluminium window and door framing systems, Alspec’s AluSpace facility in Surry Hills, Sydney provides a unique opportunity for architects, designers and clients to experience first-hand their advanced designs. The partnership with Dulux, Australia and New Zealand’s largest powder coating manufacturer, enables clients to further explore the latest in finishing trends for their framing products, giving them the benefit of additional options available for their project. For instance, pearl and metallic finishes are currently trending in powder coating, with bronze being particularly popular. For aluminium framing, the demand is for products with slimline profiles and the ability to span high floor-to-ceiling spaces. The partnership presents both opportunity and value to customers, turning AluSpace into the ultimate destination for clients to fully engage with the latest in window and door framing systems. Barry Lunn, Alspec’s national sales and marketing manager says AluSpace is much more than a showroom because it offers architects and designers an environment where they can meet with their clients and interact with the products before making their selections. “Having full-size samples means customers no longer have to imagine what the finished product will look like from photographs but can experience the full look and feel of their selection,” he added. Jason Eyndhoven, Dulux’s NSW commercial business development manager said, “This partnership will ensure clients get the very best they can, taking advantage of the latest trends in aluminium framing and powder coating. Products from both companies come with the assurance of comprehensive warranties, providing consumers the comfort of knowing they are selecting products that will endure demanding conditions and exceed performance expectations.